Spring is approaching, and that can mean only one thing – it’s time for the annual Epcot International Flower and Garden Festival! We’ve had the pleasure of visiting Walt Disney World during the Flower and Garden Festival for the past four years and can safely say that Flower and Garden is Epcot at its finest! The addition of floral displays, gardens, and food booths magnifies the beauty of Epcot and fills the park with bursts of color. 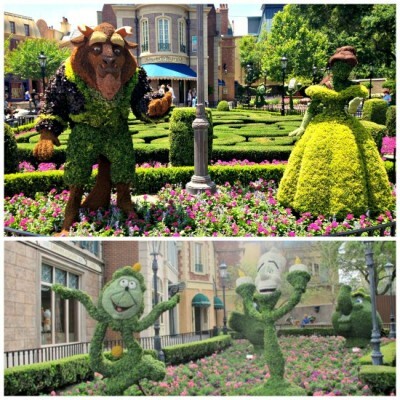 But for our family, the most magical part of the Flower and Garden Festival is the intricately detailed character topiaries dotting the landscape. 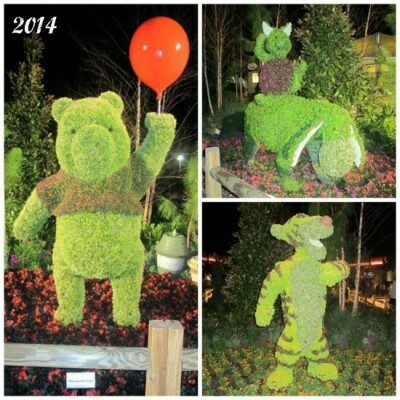 As our family prepares for our annual “pilgrimage” to visit the Epcot International Flower and Garden Festival this May, we thought it would be fun to look back at our past photos and rank our favorite topiaries from years past. 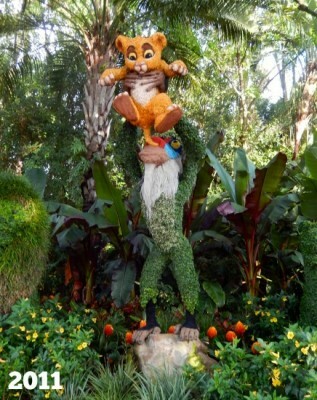 Continue reading for a rundown of our family’s top twenty topiaries! 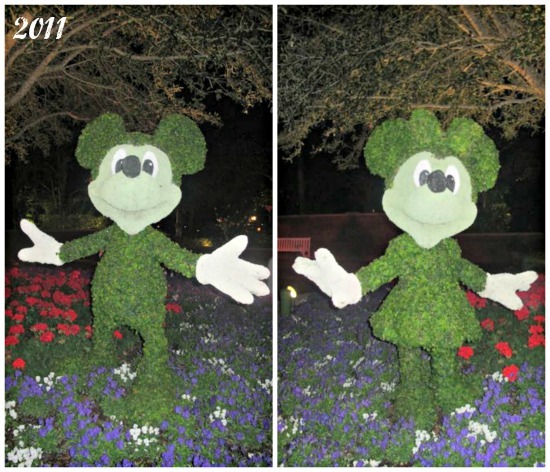 One thing to keep in mind is that some of these topiaries are returning for 2015 and some are not. 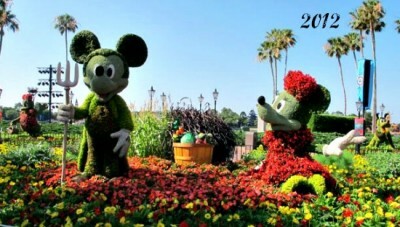 For the full list of character topiaries for this year, check here. 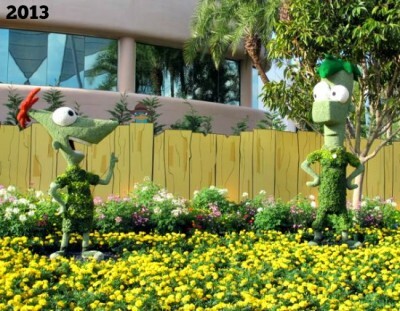 Our daughter is a big fan of these fun topiaries, and Phineas and Ferb fit in nicely with the interactive “Agent P’s World Showcase Adventure” game at Epcot. When we asked our daughter to help rank topiaries, she declared that they were all her favorite… with the exception of Lots-o, that is! 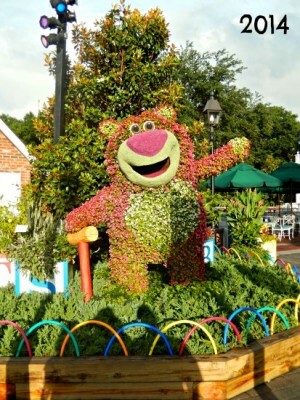 But all evil villainy aside, this is an adorable topiary that artistically incorporates flowers to create Lots-o’s signature pink “fur.” It might have just been our imagination, but we’re pretty sure this topiary even smelled like strawberries! 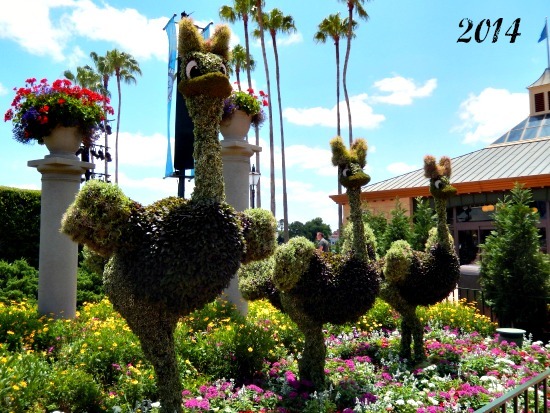 Last year the Flower and Garden Festival featured a large topiary celebrating the 2014 World Cup. 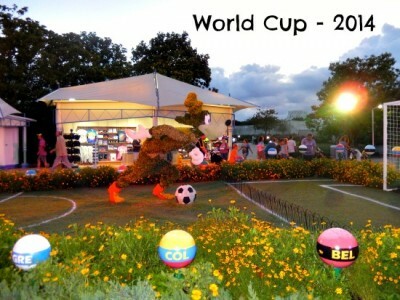 This festive topiary included a soccer field, complete with goals, and colorful balls that paid tribute to each of the countries represented in the FIFA World Cup. You can’t go wrong with these classic Mickey and Minnie topiaries – after all, it all started with a mouse! 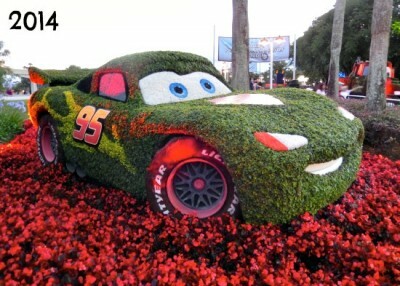 This life-sized Lightening McQueen topiary was located in the perfect spot – right by Test Track. You could fulfill your need for speed on the attraction, and then visit the Piston Cup champ as you strolled out. The Buzz Lightyear topiary was another example of perfect juxtaposition. You could check out the detailed Toy Story topiary on your way to blast off “to infinity and beyond” on Mission Space! 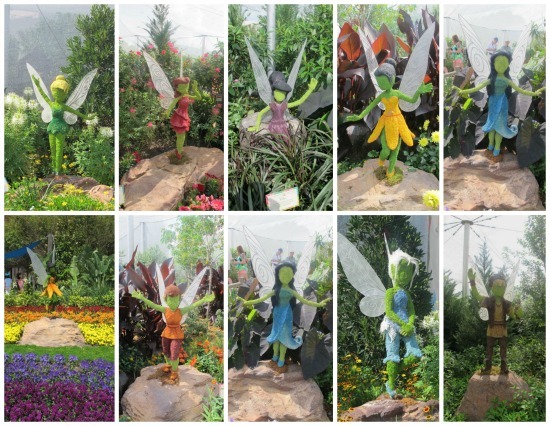 The Disney fairies topiaries have been making an appearance at the Epcot International Flower and Garden Festival all four years that we’ve attended. One year the entire Pixie Hollow crew was displayed in a beautiful butterfly house and garden. Fawn must have been working her animal-talent magic the day we visited, because in addition to the colorful butterflies, there was also an adorable bunny sneaking around the garden! This classic Fantasia topiary expertly captures the whimsy of the film. 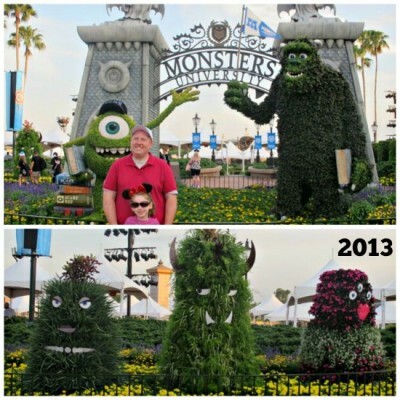 The 2013 Monster’s University topiary display featured several large monster topiaries, including Mike and Sully, and celebrated both the release of the newest Pixar film and the launch of Disney’s “Monstrous Summer” promotion. Who doesn’t love Winnie the Pooh? Everyone’s favorite hunny-loving bear and his pals have been popping up at the Flower and Garden festival each year that we’ve attended. As you can see from the photos below, there have been some slight variances in the topiaries’ details from year-to-year, but these topiaries are always top-notch! This adorable Mickey and Minnie topiary ranks higher on our list than their classic counterparts because the gardening theme is just too perfect for the Flower and Garden Festival! We also enjoy the added bursts of color in the red floral details on Minnie’s dress and bow, and the bright yellow flowers comprising her shoes. We adore the colorful details of this Rafiki and Simba topiary, and Scott always has to replicate the classic pose with our daughter when we pass by. We’ll see how much longer he’s able to pull it off! 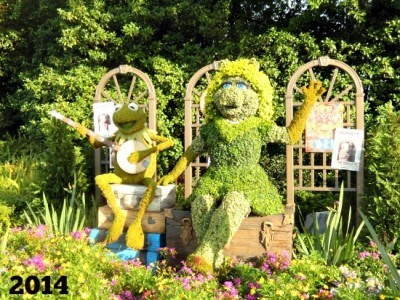 Each year there is a new topiary celebrating a recent Disney film release, and last year’s was a nod to Muppets Most Wanted featuring none other than Kermit the Frog and Miss Piggy. It’s “easy being green” on our list, as this is one of our top topiaries! 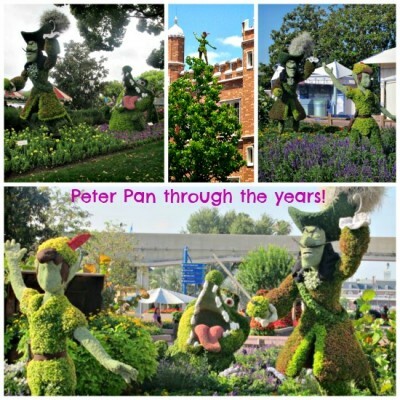 Peter Pan and Captain Hook are another set of recurring topiaries that never fail to capture our attention! You never know where these fanciful topiaries will show up – one year you had to look up to spot Peter Pan on a rooftop in the UK pavilion. And we can’t forget to mention the perfectly detailed Tick Tock Crock, always lurking close behind Captain Hook! 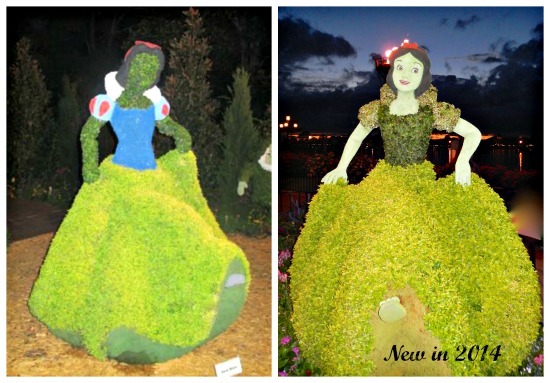 Snow White (and her 7 dwarfs) is another example of a topiary that has undergone some changes through the years, the most noticeable of which was the addition of her face in 2014. You can usually spot this Snow White topiary frolicking in the gardens of Germany – where else? 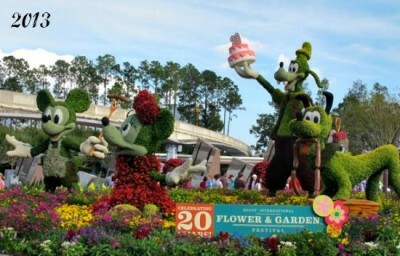 In 2013, the Epcot International Flower & Garden Festival celebrated its 20th Anniversary with this amazing topiary scene featuring the fab five (plus Daisy) enjoying a garden picnic. This ambitious topiary included Gardener Mickey and Minnie; a life-sized Goofy, complete with anniversary cake; Pluto helping himself to the picnic fare; and Donald and Daisy enjoying a game of badminton! 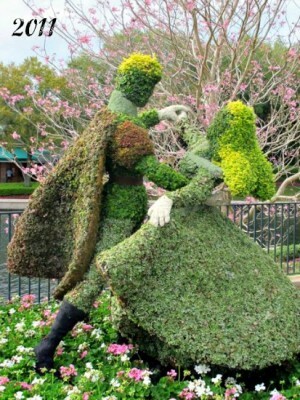 Certain as the sun rising in the East, one of the most delightful topiaries is that of Beauty and the Beast. (Sorry – we couldn’t resist!) Seriously though, this set of topiaries, which includes Belle, Beast, Lumiere, Cogsworth, Mrs. Potts, and Chip, is beyond enchanting and captures every last detail of these beloved characters! Throughout the years, the Lady and the Tramp topiary in the Italy pavilion has become so beloved by our family, that we would be heartbroken if it didn’t return. 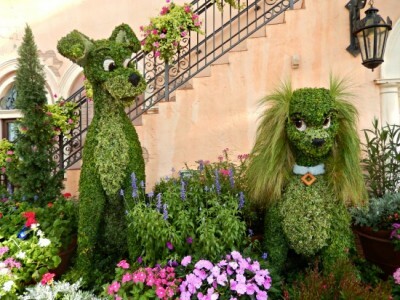 This topiary perfectly captures the details of our favorite canine characters – from their facial expressions to the wispy, hair-like plants comprising Lady’s ears – the only thing missing is a plate of spaghetti (which is available right around the corner at Tutto Italia). 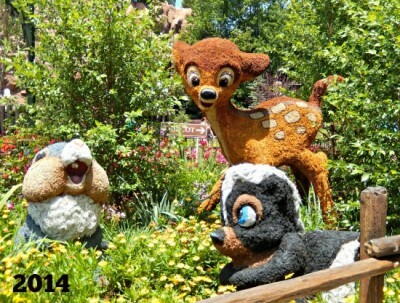 And finally, our top topiary is the colorful cuteness of forest friends Bambi, Flower, and Thumper! Our number one topiary simply screams “Springtime,” which makes it the perfect match for the celebration of Spring that is the Epcot International Flower and Garden Festival. I guess you could say that we’re “twitterpated” with this topiary! 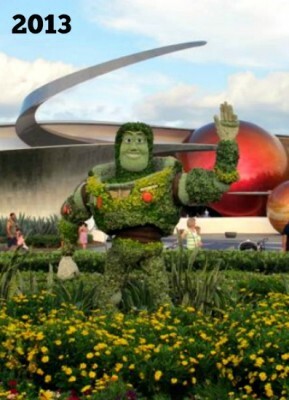 Thank you for reading along as we counted down our top topiaries of the Epcot International Flower and Garden Festival! 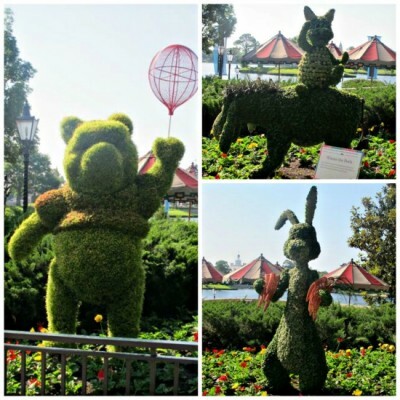 We hope that you’re feeling ready for Spring after viewing all of these amazing topiaries – we sure are (but then again, that might also have something to do with this frigid Michigan weather)! Do you have a favorite topiary? 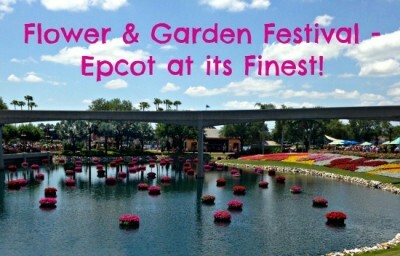 What’s your favorite part of the Epcot International Flower and Garden Festival? We’d love to hear from you in the comments!